I was running out of time to make lunch before hubby came home. I looked into my pantry and refrigerator couple of times trying to come up with something. That’s when I saw a lemon and immediately had an idea. I decided to make a Lemon Flavored Pulav with Basmati Rice similar to South Indian Lemon Rice. 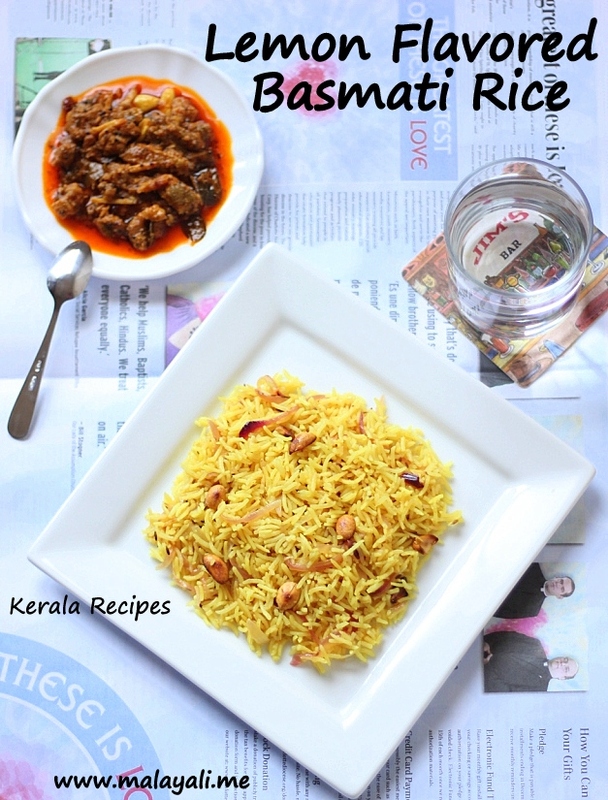 Since Basmathi Rice cooks in 10-12 minutes, I ended up with a flavorful meal in less than thirty minutes. 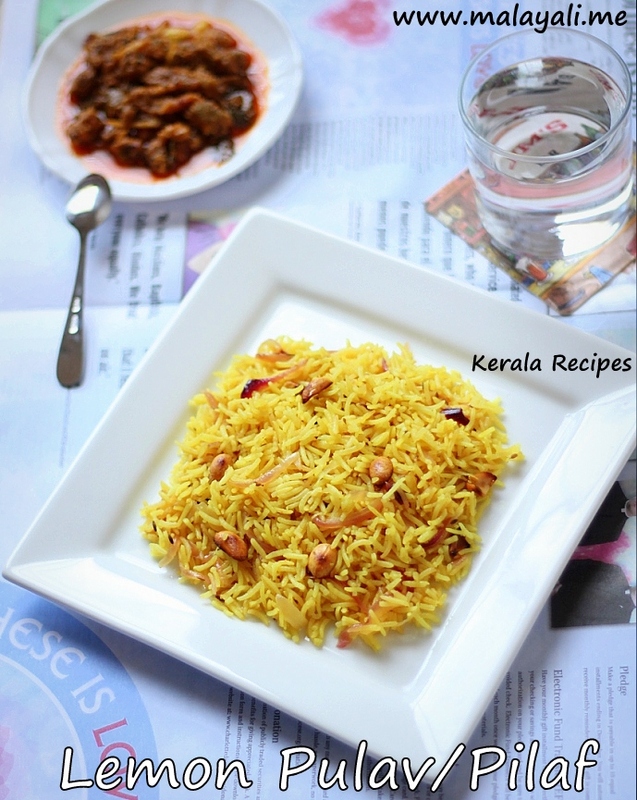 The roasted peanuts give a nice crunch to this Pulav. The rice has a delicate flavor of lemon and isn’t spicy. Kids will like this mild tasting Lemon Rice. We had this Lemon Pilaf with homemade Fish Pickle. You can also serve it with any spicy meat based curries. Soak the Basmati rice for ten minutes. Wash thoroughly and drain it. Squeeze juice from one lemon. Add it to 2 cups of water. Filter the liquid for seeds and keep aside. Heat ghee and oil in a pan or kadai. Throw in the peanuts and stir fry until it begins to lightly brown. Add the cumin seeds and give a quick stir. Next, add the sliced onions and saute until translucent. Add the drained Basmati Rice to the pan and lightly fry for 2-3 minutes. Reduce heat, add turmeric powder and saute for a minute. Pour the lemon water to the pan. Add 1.5 tsp sugar and salt to taste. Increase heat to medium-high and bring everything to a boil. Reduce heat to low and allow the rice to cook for another 7-10 minutes until all water has been absorbed. Open the pan and fluff gently with a fork to separate the rice. Serve warm.